Harare, Nov 17 (Just News): Zimbabwean president Robert Mugabe attended a university graduation ceremony Friday, making a first public appearance since the military takeover that appeared to signal the end of his 37-year reign. Despite his show of defiance, pressure mounted on the 93-year-old leader to quit as veterans of Zimbabwe's independence war -- key players in the country's power structure -- called for mass anti-Mugabe demonstrations on Saturday. 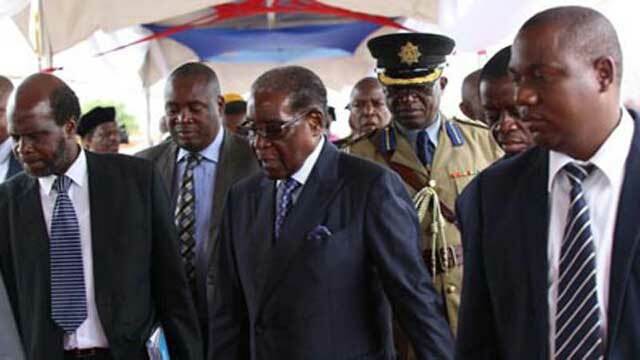 Mugabe, 93, had been confined to house arrest after the military took over the country. But on Friday, he walked into the ceremony venue in Harare dressed in a blue academic gown and tasselled hat, before listening to speeches with his eyes closed and applauding occasionally, an AFP correspondent reported. The generals took over late on Tuesday after vice president Emmerson Mnangagwa was abruptly sacked and Mugabe's wife Grace emerged in prime position to succeed her increasingly frail husband. Mnangagwa, who had fled abroad after his firing, returned to the country on Thursday and seems poised to play a central role in shaping developments. Mugabe has ruled Zimbabwe since 1980 and many citizens were stunned by the military's intervention, which was sparked by the bitter succession battle between Grace and Mnangagwa. "I'm happy with what the army has done, at least now we've got a future for our kids," Teslin Khumbula, the owner of a security company, told AFP. "We don't want Mugabe anymore... Please -- everyone go to the streets." Analysts say the military leadership was strongly opposed to the rise of Mugabe's ambitious 52-year-old wife, while Mnangagwa has close ties to the defence establishment. Mugabe and the army chiefs held talks on Thursday, but no official statement was issued on the status of negotiations that could see him eased out of office. Government television showed Mugabe, the world's oldest head of state, at the talks smiling alongside army chief General Constantino Chiwenga. Chris Mutsvangwa, chairman of the independence war veterans' association which is seen as supporting Mnangagwa, said Friday that "the game is up" for Mugabe and called for a protests against the president. "It's done, it's finished... The generals have done a fantastic job," he said at a press conference in Harare as he called for a mass demonstration on Saturday. Veterans of Zimbabwe's independence war were loyal supporters of Mugabe, but they turned against him as friction grew between the president and the military. Mnangagwa, 75, fled to South Africa following his dismissal and published a scathing rebuke of Mugabe's leadership and Grace's presidential ambitions. The military said Friday they had detained some "criminals" in Mugabe's government in a reference to supporters of Grace's presidential ambitions. Grace has not been seen since the takeover of the military, which has not overtly called for President Mugabe's resignation. Morgan Tsvangirai, a former prime minister and long-time opponent of Mugabe, has said Mugabe must resign "in the interest of the people", added that "a transitional mechanism" would be needed to ensure peace. Harare's residents have largely ignored the few soldiers still on the streets with shops, businesses and offices operating as usual. Eldred Masunungure, a lecturer at the University of Zimbabwe, said the formation of a "pre-election coalition" could be a viable response to the crisis. In Paris, the head of the African Union, Guinea's President Alpha Conde, warned Thursday that the continent "will never accept the military coup d'etat" in Zimbabwe and called for a return to the "constitutional order". "(Problems) need to be resolved politically by the ZANU-PF party and not with an intervention by the army," added Conde. Meeting in Botswana, the SADC called for an emergency regional summit to help resolve the crisis, urging Zimbabwe to "settle the political challenges through peaceful means". Britain, Zimbabwe's former colonial ruler, said elections scheduled for 2018 should go ahead. In Ivory Coast, President Alassane Ouattara on Friday saluted Mugabe's role in the fight against colonialism, saying he "has been the object of respect and even adulation from many Africans and young Africans." "But the world has changed," he said. "Clearly, given his age and the long time he has spent in office, everyone is aware that it is time for him to hand over his seat to a new generation."